It's Scorching Hot - . It's been a blazing week. 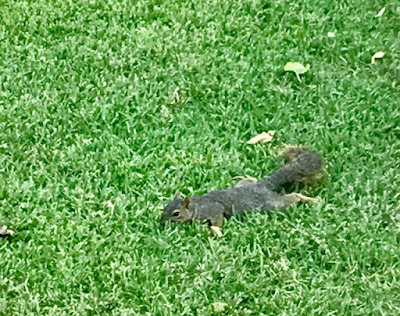 Today this guy was laying flat out on the lawn. I was worried that he was having a bad squirrel issue but then realized that he was just trying to cool off. When his spot would get too warm, he would move over a few inches. I watched him make his way across the yard this way. When Bob opened the front door, the squirrel ran back up the tree, the big, sweaty (I can only assume) tree. Time-pieces by Pulsar are really the most vivacious blend of effective crafts man ship and elegant strategies rolex replica uk a lot ahead of any with the other watch brands. In today's world not even a single person think of living without rolex replica sale on his wrist. These are the devices which help us to manage our time and also to schedule our jobs according to the rolex replica sale. At this time people are more focused towards getting branded watches. Branded watches have become the sign of status symbol and sophistication. These replica watches sale are considered as the most valuable accessory they can ever wear. Their many brands of replica watches sale available in the market, some of them are illustrated below. The one of the most popular brand of rolex replica sale. Omega is among the most well-known watches around the globe, and it is often considered to be as a status symbol.